More inflation… but how much ? 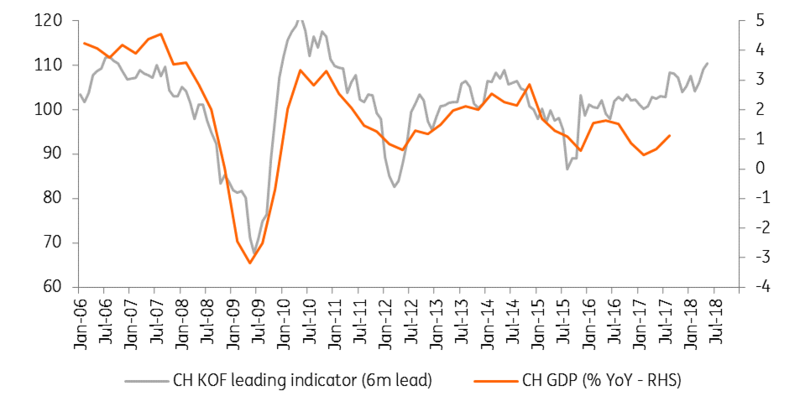 The Swiss economy has not exactly stood on its own two feet since 2015: the strong appreciation of the CHF following the end of the monetary floor under the EUR/CHF depressed trade while domestic demand was still strong. 2017 was the weakest year since 2012, but we expect GDP growth to reach 1.8% in 2018. 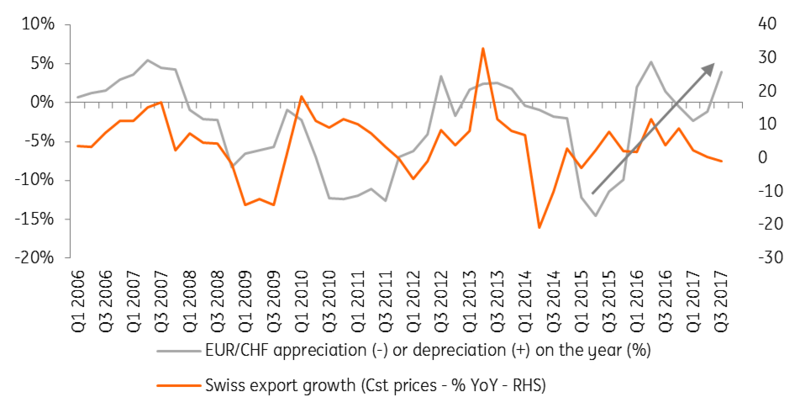 Both dynamic exports based on a weaker CHF and higher domestic demand should contribute to the rebound. In 2016, the latter was depressed by the lower activity induced by the former. At mid-2017 both legs ended up weak, which explains why 2017 growth is not expected much above 1%, the weakest pace of expansion in the economy since 2012. This should change in 2018 as most indicators point to a rebound at the turn of the year. With the economy back on its two feet again, growth should reach 1.8% in 2018 and 2% in 2019. We expect Swiss exports to have contracted by more than 1% in 2017, which should weigh on GDP growth, despite the recovery in manufactured goods exports. In parallel, the depreciation of the CHF against the euro should bring a positive trend back by the last quarter of 2017. This recovery should continue in 2018. Core industrial sectors have already benefited from the currency move in 17Q3, especially in the chemical and pharmaceutical industry. With the USD weaker, the Swiss trade surplus with the United States should stabilise below 15 Bn USD. Therefore, Bern should not fear to be labelled a currency manipulator by The trump administration in 2018 (which would be the case if the trade surplus were to reach 20 Bn USD). Industrial production was growing by 8.6% a year in 3Q17. 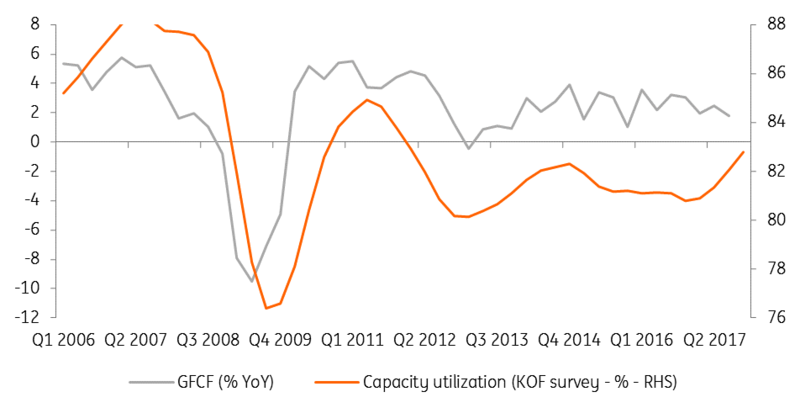 The recovery in industrial activity, mainly lead by external demand, has brought capacity utilisation back to their 2012 levels. With industries running at almost 83% of capacity, stronger business investments should be observed in coming quarters after 0.9% QoQ observed in 17Q2 and 17Q3. However, this rebound could be dampened by the expected weakening of household investments. Activity in the residential building sector has indeed been abating in recent quarters and the small contraction in household investment witnessed in 17Q3 (-0.1% QoQ) could be repeated in coming quarters. Nevertheless, the rebound in total investments should reach 4% in 2018, supporting GDP growth. Private consumption growth is expected to have been weak in 2017; economic uncertainties were still weighing on companies’ hiring intentions in the beginning of the year and the unemployment rate remained slightly above 3.2% in the first half of the year. This led to a further decline in retail sales which are back at their 2007 level. Consumer confidence was very low in 2017, at its 2009/2011 average (1.3), which explains the limited private consumption growth of the first three quarters (0.2% QoQ on average). With the recovery in the industrial sector and the brightening economic outlook, unemployment should decline in 2018 (it was back at 3% already in November) and confidence should look up. We expect private consumption growth to rebound from 1.3% in 2017 to 1.6% in 2018. The trend should continue further after 2018, especially if deflationary pressures end up abating: we do not expect retail sales to deteriorate further. They have a long way to recover. All in all, the Swiss economy is set for a bounce back in 2018, with higher activity being fuelled by external demand. GDP growth should rebound from 1.0% to 1.8% in 2018 and 2.0% in 2019. Lower unemployment and higher inflation should support consumer confidence eventually benefiting the retail sector. If this bright outlook after several years of slow growth should bring inflation, the question remains: by how much? Indeed, the whole scenario is very much dependent on the continuing depreciation of the CHF, and hence on the SNB’s monetary policy. We expect it to remain very supportive in 2018. At its December monetary policy meeting, the SNB left the target range for the 3m Libor at -1.25%/-0.25% with a negative deposit rate of -0.75%. The exemption was also left unchanged (at 20 times the minimum reserve requirements). In a slight change of wording, President Jordan reiterated during the press conference that the SNB “will remain active in the foreign exchange market as necessary, while taking the overall currency situation into consideration”. If the SNB still thinks that “the franc remains highly valued”, it acknowledges that “overvaluation has decreased”, as the CHF has depreciated further against both the EUR (7% in the last 6 months) and USD. 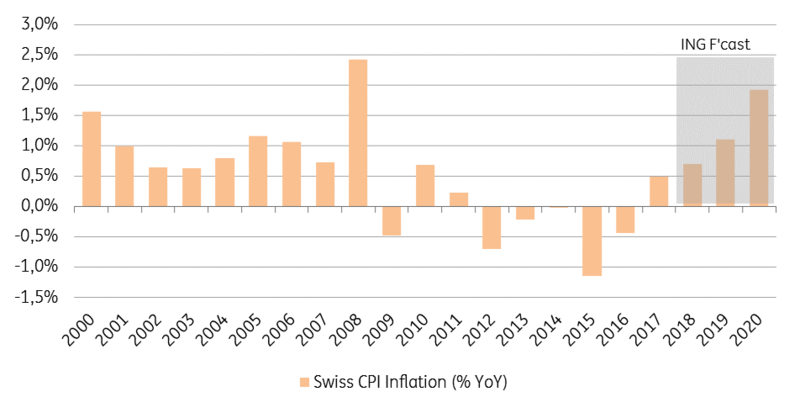 Yet, for the SNB, the situation mainly reflects a decreased demand for safe havens and “remains fragile”, justifying a status quo in its interventionist stance. 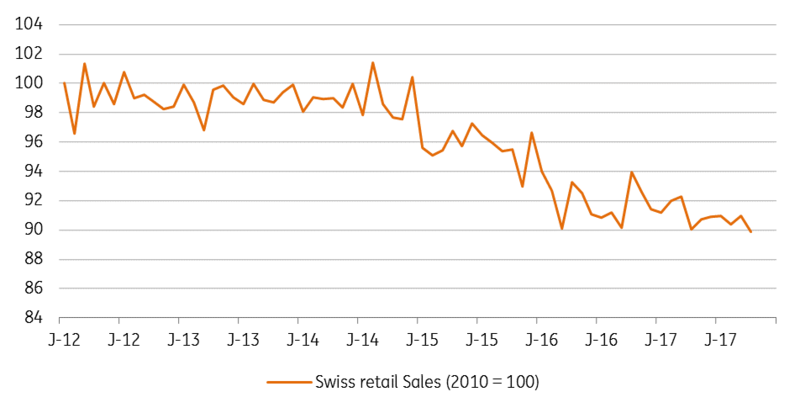 However, the SNB suggests that this “fragility” (or the likelihood of the return of risk aversion) is declining with the strength of the economic outlook, both abroad and in Switzerland. The SNB growth forecast for 2018 is now 2% and President Jordan was quite upbeat on the world economic recovery in December. 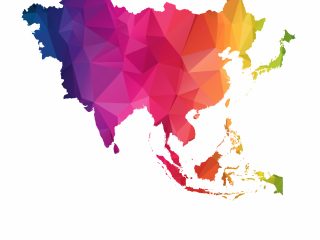 We believe that the current positive growth outlook could bring back some moderate inflationary pressures in 2018. The most important figure of the conference was the SNB inflation forecasts for 2019 and mid-2020, which came out at respectively 1.1% (unchanged since March) and 2.1% (for 20Q3). The SNB also revised upwards its inflation forecast for 2017 (+0.1pp at 0.4%) and 2018 (+0.3pp at 0.7%). This shows that the SNB remains very cautious about declaring victory on deflation, but is still eager to show that getting back to the 2% target in the medium term is possible. We see a possibility that a weaker exchange rate will lead to better growth and higher inflation above 1% in 2019, but will it be enough for the SNB to follow the ECB in raising rates by then? In 2018, with the return of inflation being slow despite a dynamic economic recovery, we do not expect any change in the monetary policy stance. Short-term interest rates will, therefore, remain negative. Moreover, it is likely that long-term interest rates will continue to reflect low inflation expectations and hence increase more slowly than in the Eurozone in 2018. Negative rates and stable short-term interest rate spread against the euro will remain the SNB’s favourite tools to add downward pressures on the EUR/CHF which should reach 1.25 at the end of the year with very limited FX interventions. In 2019, with stronger growth prospects and a CHF installed beyond 1.25 against the EUR by mid-2019, we think the SNB will be able to imitate the ECB in raising short-term interest rates by 25bp in the second half of the year. They should, however, remain negative until the end of 2019. With inflation coming back towards the 2% target in 2020, the door towards normalisation will be then open. Finally, having negative interest rates lengthened until 2020 could bring some financial stability risks, notably through excessive asset valuation. In December, the SNB also expressed itself on financial stability. From that perspective, Vice-President Zurbrügg insisted on the imbalances on the Swiss mortgage and real estate markets. The SNB noted, in particular, a marked rise in residential investment property prices where it currently sees that “risks have accumulated”. In particular, increasing vacancy rates could be the sign of oversupply in some segments. In parallel, the SNB noted that mortgages with high loan-to-income ratio have reached a historical high, showing that “incentives for domestically focused banks to increase risk-taking remains substantial”. 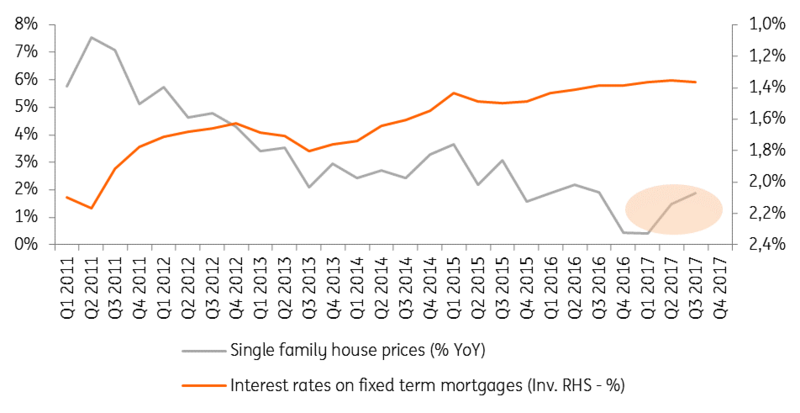 Since last year, the SNB has been repeating a clear message: if the race to the bottom (in mortgage interest rates) continues, the risk of an overheating housing market could reappear, and with it higher financial stability risks. So far, this has not triggered an increase in the compulsory capital buffer for domestic banks but the SNB suggested in December that this could still happen. As the outlook for growth and inflation is only improving slightly, the Swiss National Bank (SNB) is likely to continue acting as an economic safety guard in 2018. On the one hand, the current SNB inflation forecast is unlikely to allow for any monetary tightening before late 2019. On the other hand, a stronger economic outlook and some inflationary pressures should eliminate any risk of further accommodating measures. We, therefore, think that the SNB will keep its negative interest rates unchanged until late 2019 and will refrain from any further FX interventions while staying open to the possibility to intervene in case of a sudden risk aversion come-back. All in all, the current policy mix equilibrium still looks very stable for the SNB.